Muthappan Temple, also called Parassinikadavu Muthappan temple is a Hindu temple, located on the banks of the Valapattanam river about 10 km from Taliparamba in Kannur District, Kerala. Principal deity of the temple is Sree Muthappan, a manifestation of two mythical characters called Thiruvappana and Vellattam. According to the local tradition the presiding deity is a folk deity and not a vedic deity, but there are recent attempts to associate the deity to Vishnu or Shiva. 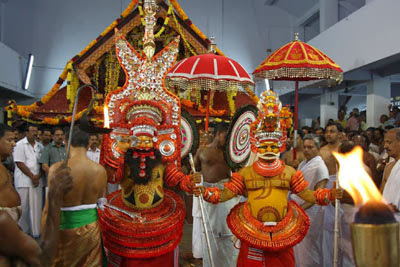 Rituals of the temple is unique in that it does not follow the Satvic Brahminical form of worship, as in other Hindu temples of Kerala. 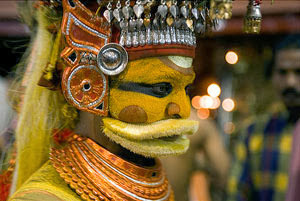 The main mode of worship is the a ritual enactment of both the characters of Muthappan, through a traditional dance known as Muthappan Theyyam. Fish, and toddy are the customary offerings to Muthappan. Muthappan Thiruvoppana Mahothsavam is the major festival of the temple, celebrated for three days every year on 19, 20 and 21 of Kumbham (the days correspond to 3, 4 and 5 March). Timing :- Vellattam and Thiruvappana are performed every day morning from 5.45 to 8 am. Vellattam is also performed at evening by around 6.30 pm. 1. Thulam 1st to Vrischikam 15th every year. 2. Amaavasi (new moon) day of Karkkitakam and Thulam. 3. "Nira" day of the temple. 4. When there is a death in the Madappura family. Apart from this you can visit Parassini Madappura at any time and even you can stay overnight here. You will get food from Oottupura. As the temple welcomes all irrespective of their cast, religion and nationality, people from all walks of life reach here. You can spot even international tourists praying before the Muthappan. Some of them spend a few days and go back to their own destinations with a fresh mind of peace and great relief. Before entering the main temple you need to do is to climb down the steps to reach the river and clean your body. After cleaning, enter into the inner premises (Sreekovil or Sanctum Sanctorum) of the temple. Here you won't face such large queue for Dharshan (seeing the deity) as you would normally see in other great temples. 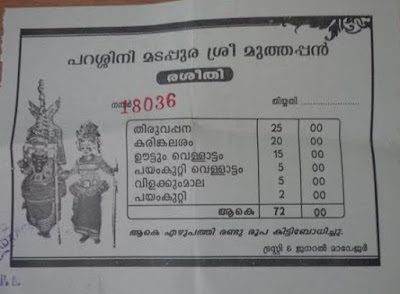 Pray before Muthappan and put some money, as you please, into the box (Hundi) provided. Vellattam or Thiruvappana is a must watch item and the most sought after one by the devotees. After the performance, devotees queue up before Muthappan and convey their problems to Him. He in return passes some kind words, which gives great relief to the devotees. Muthappan's sudden replies do provide some solace to them an they return happily and hopefully..
One of the finest temples in Kerala,on the banks magnificent river svenic beauty. You feel the inner peace. kindly display the details of various vazhipadu such other temples eg. pushpanjali, dhara , payasam etc,,,,how can we sent the cash for the same on which address and a/c number bank name for online transactions.